Probably the oldest type of language puzzle in all cultures is "The Riddle". These puzzles are well known in religion, philosophy, politics, and literature. The photo on the left is of the actor Frank Gorshin who portrayed"The Riddler" in the TV series "Batman". 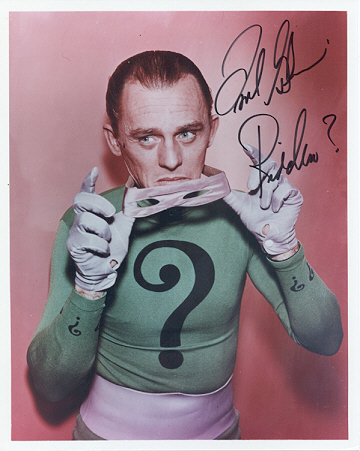 Gorshin was a protagonist whose riddles teased and baffled Batman and Robin. A "riddle" is word puzzle in the form of a question or rhyme. The words contain clues to the answer. Answers to the riddles: a mule; time; musicians. In many cultures today, one of the most common language puzzles that can be easily identified is the crossword puzzle found in a daily newspaper. 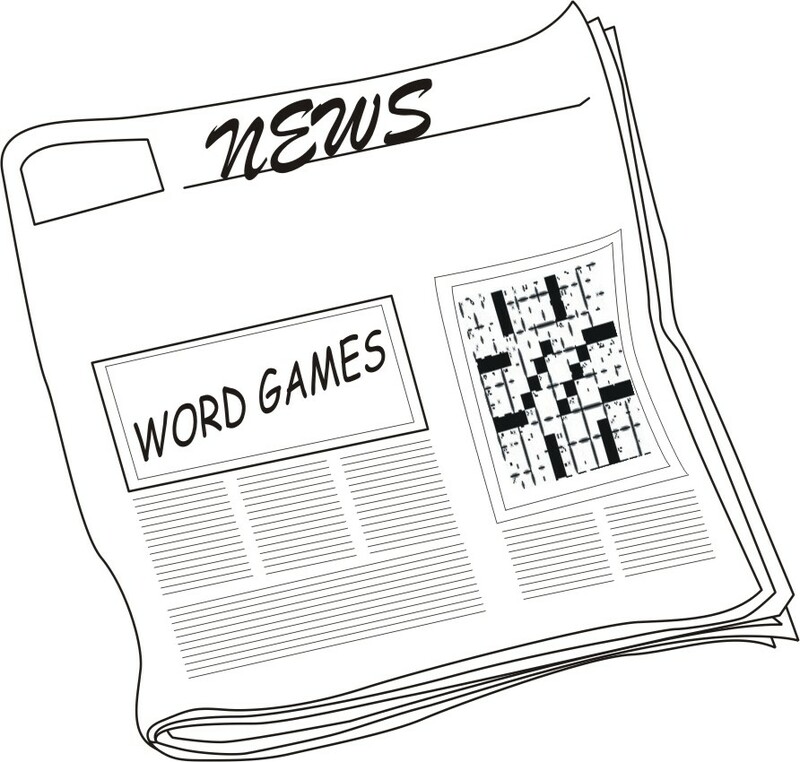 In fact, many newspapers publish a new and different crossword puzzle every day of the week. The only equipment required to play (besides the newspaper) is a pencil - with a good eraser! However, not only are their crossword puzzles in newspapers, but a number of other language puzzles as well, such as: cryptograms, letter scrambles, and Scrabblegrams to name just a few. The collection contains a number of word puzzles that are published in daily newspapers. One type of word puzzle is called a Word Search Puzzle, though it may have another title. The puzzle consists of a matrix (say 12x15) with letters in each of the cells. Reading across a row or down a column, one is immediately aware that the letters don't spell out words. Each puzzle has a title and a list of words related to the title. The instructions indicate that a player should find the listed words in the matrix, however, the words run in all directions - forward, backward, up, down, and diagonally. 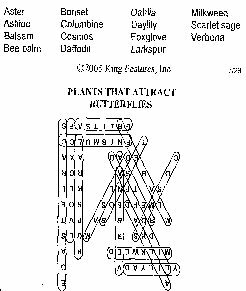 For example, a puzzle published by King Features, Inc. in 2005 had as a subject "Plants That Attract Butterflies", accompanied by a list of 15 words. Using a pencil, a player attempts to encircle the letters in the matrix which are the words in the printed list that relate to the subject. Many of the letters in the matrix are unused. 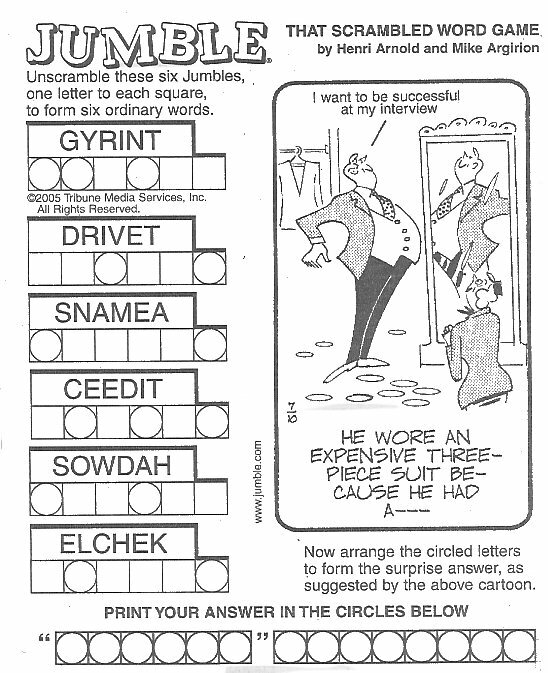 Like other daily newspaper games, this group relies upon scrambled letters, but offers clues in the form of a cartoon. This is a very popular game, and is found not only in daily newspapers, but in a series of published books for puzzlers. The graphic to the right is copyrighted by Tribune Media Services, and illustrates this type of game. The puzzler is asked to unscramble six jumbled words. Using the letters that are placed in the circles, and looking at the cartoon, the "unjumbled" answer is to be placed into the circles at the bottom of the illustration. Another type of daily newspaper puzzle is based upon cryptography or the science of codes. Code breaking can be traced back to ancient times. Anyone who has read a Sherlock Holmes story has been introduced to code breaking. In the contemporary puzzle a common phrase or quote is offered in a coded fashion and the puzzler, through a process of letter substitution and trail and error, attempts to discover the code and solve the puzzle. For example: a two letter combination such as "wi" may appear in the puzzle. This combination may be the word "as" or "if" or "it" or "we", etc. If the "w" is indeed an "i", then all "w"s throughout the puzzle are really an "i". These few examples just scratch the surface of the range of language puzzles that are available in published book form and on the World Wide Web as well. Some puzzle types are very old, such as Acrostics which were known in the ancient world, while others such as Word Ladders are puzzles invented in the 19th century by Lewis Carroll, author of Alice's Adventures in Wonderland. There are mini-mystery story puzzles, and "homophone puzzles". The latter are very specific language based, and concern words that sound alike, are spelled differently, and have different meanings. A trip to a large bookstore these days will illustrate the amazing variety and scope of language puzzles now available. However, perhaps the most popular and best known are Crossword Puzzles. A crossword puzzle is primarily a game for one person, and it is played on a square matrix or grid of black and white cells. The intent of the game is to write letters in the white cells across each row of the matrix to form words, but at the same time form words down each column of the matrix with the letters used. Cells that are black separate words. Cells that are to contain letters, are numbered left to right (referred to as "across"), and top to bottom (referred to as "down"). Along with a blank matrix are a corresponding numbered list of "across" clues and "down" clues for the words to be used. Clues are specific, i.e. - 23,30,33-Down: "Combination" (3 cells) and 30-Across: "PC Symbol" (4 cells); Answers: "mix", "icon". According to David Parlett (Oxford History of Board Games, 1999, page 374), "The first crossword, then called Word Cross, was devised by Arthur Wynne, a British Journalist, and published in a 1913 edition of the New York World." Today, there are crossword puzzles designed and theme for special player interests, using words about nature, food, Hollywood, etc. Crossword is a game that also has been adapted to a range of word games on tiles, cubes, and boards. R.C. Bell ("Word Games", Games & Puzzles, 12/1974, pp. 14-16) reports that the first boxed word game probably appeared earlier than 1850 and of French origins. One game in his collection includes a board with square bone tiles engraved with capital letters. Bell says the game was patented in 1886 and is a puzzle-game "...suitable for teaching children their alphabet and also for a form of solitaire in completing words or phrases in a given time." To see examples of a number of "boxed" word games on tiles, cubes, and the like, click on the menu item in the left panel.